Subtle style to enhance your garden plants. A contemporary & stylish pot, perfect for housing a whole host of flowers, trees, shrubs and bulbs. The classic ‘art-deco’ design with a subtle metallic finish will fit any garden. Particularly great for standard plants up to 90cm tall, such as bay trees, olives, phoenix palms, or even buxus. Supplied as a single 11inch pot made from heavy duty polypropylene - UV stable, weather resistant and has drainage holes already inserted. 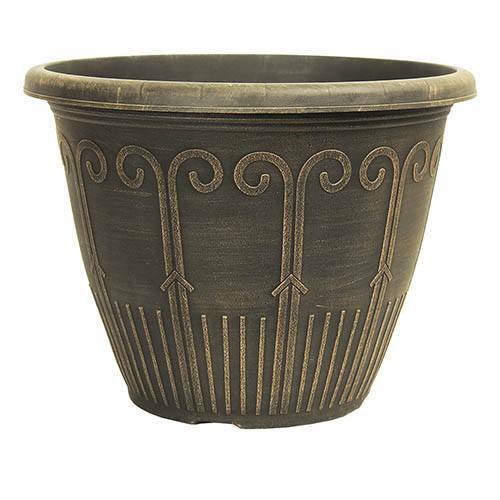 This classic looking, long-lasting, sturdy mid-size plastic planter has a beautiful decorative design and is hand wash painted gold over brown/black to create a contemporary looking pot, perfect for housing a whole host of flowers, trees, shrubs and bulbs. The classic ‘art-deco’ design with a subtle metallic finish will fit any garden and it's particularly great for standard plants up to 90cm tall, such as bay trees, olives, phoenix palms, or even buxus. Place by doorways, pathways and patios to create an elegant, contemporary feel. Made from heavy duty plastic that is both UV stable and weather resistant, it's durable and can be reused year after year. Supplied as 1 x 28cm (11in) Plastic Planter with a cocoa gold finish. Made from a durable UV stable plastic and hand painted with a metallic gold finish.